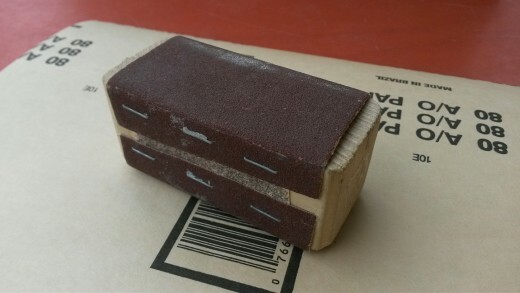 Sandpaper is a great tool, which we often use in our workshop. It is very safe to use, compared to some tools, so even our youngest visitors can experience wood shaping. 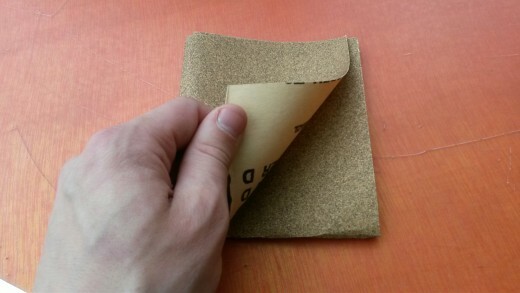 Sandpaper is essentially, as the name suggests, sand stuck on paper. These hard particles will scratch into wood, plastic, and other materials. The size of these particles determines the roughness of the sandpaper. 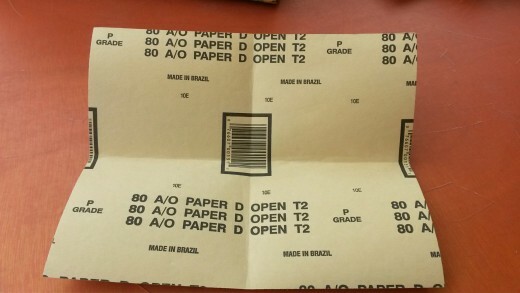 This is called the ‘grit’, and lower numbers are more rough. Sandpaper is available in ranges from 50 to 1000, which is used for polishing materials and sharpening tools. Sand as an abrasive has been used for thousands of years, an early example being the smoothing of stones used in the great pyramids of Giza, Egypt. Thin copper strips covered with sand were rubbed into stones, wearing away along the edge, much like a saw. In Japan’s rich woodworking tradition, scouring reed is used like high grit sandpaper in the final smoothing of cabinets and furniture. Check out the video to see it in action! As you work, some of the grit will wear off the paper backing. As this grit wears away, the paper becomes less effective. Finding a fresh spot on your sheet of sandpaper or replacing it with new piece will speed along your sanding work. Sanding very rough surfaces or very tough materials may result in a torn sheet of sandpaper well before the grit wears off the paper. 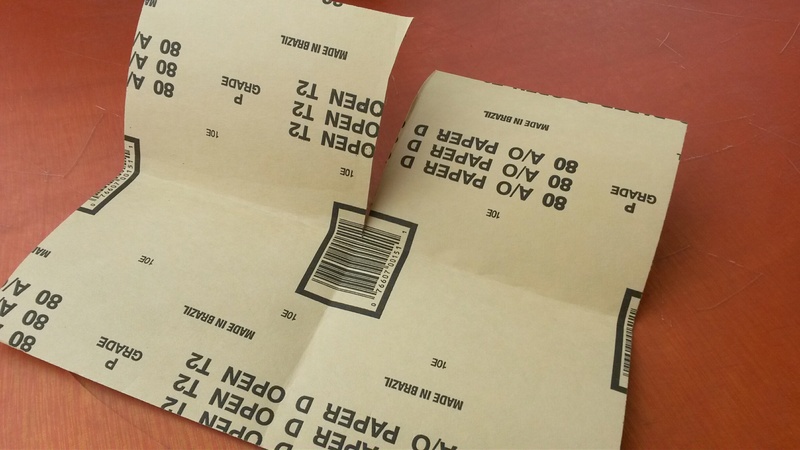 Extend the life of your sandpaper by reinforcing the back with a piece of tough tape, like duct tape. 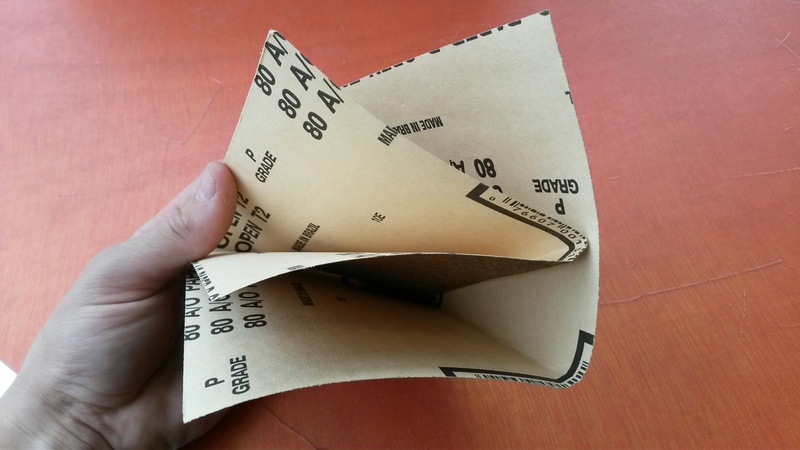 Its handy to use a larger sheet that is folded so when a fresh surface is needed, the paper can be turned over or unfolded. However, if the rough sides touch, they will wear each other out. This can be avoided with a simple folding scheme pictured below. In this way, no rough sides are touching. Sandpaper can make quick work of wearing down a piece of wood. It can also wear down and damage the tools which we would usually use to cut smaller pieces. Instead of a knife or scissors, use a straight edge, like a ruler to guide a tear across the paper. 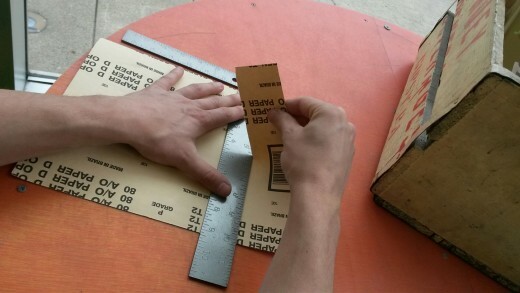 Put the ruler down across the back of the sandpaper, and pull the sandpaper up and toward yourself. Holding sandpaper in your palm or on your fingertips is great for following curved shapes. When sanding flat surfaces, it can be helpful to staple some sandpaper around a similarly flat block of wood. The wood block makes it easier to hold, and provides even, flat pressure when sanding.